Medals are available to National Servicemen who served and meet specific eligibility criteria. 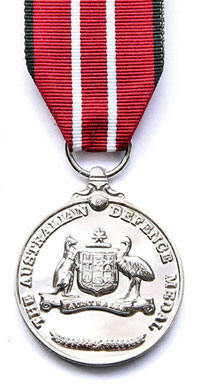 Application forms for the Anniversary of National Service and the Australian Defence medals may be obtained from your Local Federal Member of Parliament, the Returned and Services Leagues of Australia and the Directorate of Honours and Awards webpage found within the Department of Defence web site. 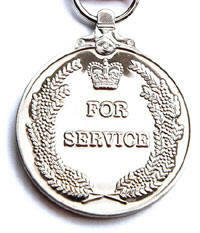 The Anniversary of National Service 1951-1972 Medal (ANSM) was introduced in 2001 to recognised those who completed their obligation under the two National Service schemes that had operated in Australia between 1951 and 1972. 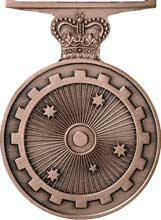 The medal is bronze with front having a central device derived from the current Australian Defence Force Emblem reflecting, more historically, national service as it related to the defence force during the 1950s and 1960s, with the crossed swords of the Army taking precedence, being the arm predominantly affected by national service. Surrounding the outer edge are the words 'ANNIVERSARY OF NATIONAL SERVICE' and at the central bottom edge, the years '1951-1972'. The reverse side bears a central device of lines radiating from a nucleus, over-layered with the stars of the Southern Cross, representing national service being influential in the machinery of the defence force during a time of need and its broad impact in Australia. Surrounding the central device is a cog, the traditional symbol representing the spirit of cooperation between the Australian Defence Force and the Australian community, thus recognising those who accepted the obligation to serve as part of national service. The ribbon has a central yellow stripe, flanked by two dark blue stripes, which are in turn flanked by white, green and light blue strips and ochre edges. The central yellow and dark blue stripes represent Australia's national colours of the time; the white, green and light blue represent the Navy, Army and Air Force, and the outer ochre stripes represent the Australian soil. Eligibility is dependent upon a persons obligation to serve and upon this obligation being fulfilled under the National Service Act 1951 (as amended), as it applied to the individual at the time of his service. Additionally, he must not have been discharged for disciplinary reasons. No women were conscripted under the National Service Act. The ADM was established to recognise Australian Defence Force Regular and Reserve personnel who have demonstrated their commitment and contribution to the nation by servicing for an initial enlistment period, or four years, whichever is the lesser. The ADM is a cupro-nickel medal. The front shows a stylised version of the Commonwealth Coat of Arms used on the Australia Service Medal 1939-45 above a sprig of wattle and surrounded by the inscription 'THE AUSTRALIAN DEFENCE MEDAL'. The reverse side has the inscription 'FOR SERVICE' below the Crown of St Edward all surrounded by a wattle wreath. The use of the wreath acknowledges the sacrifice of those who have died in service or been discharged due to injury resulting from service, a secondary qualification for the medal. The ADM ribbon is red with black edges, the colours of Flanders Poppy that represent the Anzac spirit of the Australian Armed Forces. The white stripes divide the ribbon into three, to denote the three Services and also represent service contributing to the peace of Australia. their initial enlistment period or four years of service(whichever is the lesser) and all of the relevant service was after 3 September 1945. Unable to complete their initial enlistment period due to Defence Policy workplace at the time. All applications for Medals must be accompanied with copies of any proof you have that you was a member of Australia’s Defence Forces. Contact National Archives, Department of Labor and National Service, phone: 1300 886 881for a copy of your National Service Registration papers. Without a copy of these papers you will not be recognized as having done National Service as the Army did not control National Service the Department of Labor and National Service are the only department that has these records you can at the same time apply to Soldier Career Management Agency for a copy of your Service Record for future reference. I hope that this information assists you in obtaining any Medals that you may have earned during your Defence Force Service.